Hello, Heather. How are you feeling on this fine Scottirday? I feel good. My breakfast was good, my dinner was good and the walks were fun...oh, and Scottie Mom let us sleep under her bed last night (since Scottie Dad's away!). Scottirdays are the best! I don't know why that crazy vet lady says my liver value still isn't right. I feel just fine. Their machine is probably broken so don't you worry about that, Scottie Mom and friends! We all know you'll get better, Heather Bether. Tell me: with Scottie Dad away, how would you like to spend the rest of your weekend? Oooh...first, I would like unrestricted access to the couch. Great! And permission to sleep under the bed? If you don't tell, I won't. Yea! How about longer and more frequent walks? We can certainly do that as well. A trip to a park. A visit to another doggie boutique, perhaps find a Halloween costume...you know, I'm sure there are few shops around here left to be explored. Maybe you can scope out some of my birthday presents! I think we can do that. I'll see what new stores I can find. How about treats for breakfast? And treats for dinner? Oh, can we please, please, please have some of that moist food again? No to treats. Maybe for moist food one day in the coming weeks. Scottie Dad's friend lives a few hours away, Heather. He can't visit as often as he'd like. So, he's not coming back?? Oh, Heather. I'm sure he is but not soon. He invited you and Mr. K to come with Scottie Mom and Dad when we go see him in Charleston, S.C.
Where are you going, Heather? To grab my things. Get the leash, Mom! I'm almost ready to go. Can you give me a quick brushing and maybe a doggie treat to freshen my breath? A girl's got to look her best! Heather Bether, we can't go today. Scottie Dad isn't even home! Oh, right. Well, we need to go soon. Tell Scottie Dad to get home faster. I will. Tell me, Heather: how did you know to pick Peru for the Project: International Scottie Love win? A lot of Scotties from Peru submitted their photos this week! Oh, call it a hunch. Peru did take the lead this week, didn't they? SO MANY SCOTTIES! South Africa is not far behind, though. Peru has submitted eight Scottie photos and South Africa has six. I mean, of course, I'm sure Peru will finish first. It's destiny. Is that so? And what about the Stateside Scotties? You picked Tennessee. Yes, and I think they'll eventually come around - I know for sure there are a lot of Scotties there. I lived with them for a good bit before I found you! Very well, then. Well, Heather, I'm feeling pretty sleepy. You ready to turn in? Not quite yet. I have an idea. Mr. K and I have done our best in these interviews to show our new friends who we really are (some of us have done a better job at it, just sayin'...). I was thinking maybe we haven't answered all our new friends' questions so I want to open it up for everyone to ask either myself or Mr. K a question at any time and we'll get back to you in our next interviews. This is very important, Scottie Mom, so please do this. 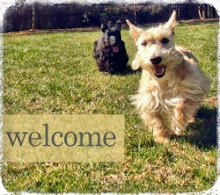 You never know when a Scottie friend wants to know my advice or opinion on something, like how to catch a squirrel or persuade their Scottie Mom to do something. Or maybe another hooman has questions about what life is like as a Scottie or what to get their furry friend this holiday season. Sounds good, Heather. I'm sure your new friends would like to ask you a few questions so how about we invite them to ask in the comment section below and then you and I will head to bed and get some beauty rest? Oh, that's a really good idea. I have to make sure I get plenty of that. You never know when life might inspire an impromptu road trip to Charleston! And this girl's got someone special to impress! Night, Mom!! Bonnie sends her kindest regards and promises to write as soon as mom lets her back on the laptop! Hi, Heather Bether! Yes, I do need some advice and I know you're just the one to ask. 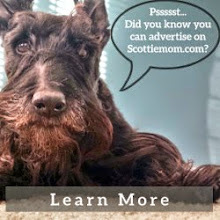 My Scottie Mom tells me she has had 2 Scots before me and they both "Aroo-ed" and she cannot understand why I don't. Mom sits me in her lap, puts her face close to mine and makes this awful sound....trying to "aroo" but because she's not one of us the sound is not quite right. I am confused...am I supposed to be arooing? What does it mean when we aroo? What does it mean that I don't aroo? Is there something seriously wrong with me that I don't aroo? I know I bark really well as Mom is always telling me to knock it off, or stifle it. I think the fact that I don't aroo makes her feel badly. I love her and want to please her (most of the time) but I just don't understand this aroo-business. Can you give me lessons? P.S. Would love to take you out for a cookie, a drink of water and a walk in the park. What a stunning interview - we all just loved it! Hey Heather, Maggie's mom here. 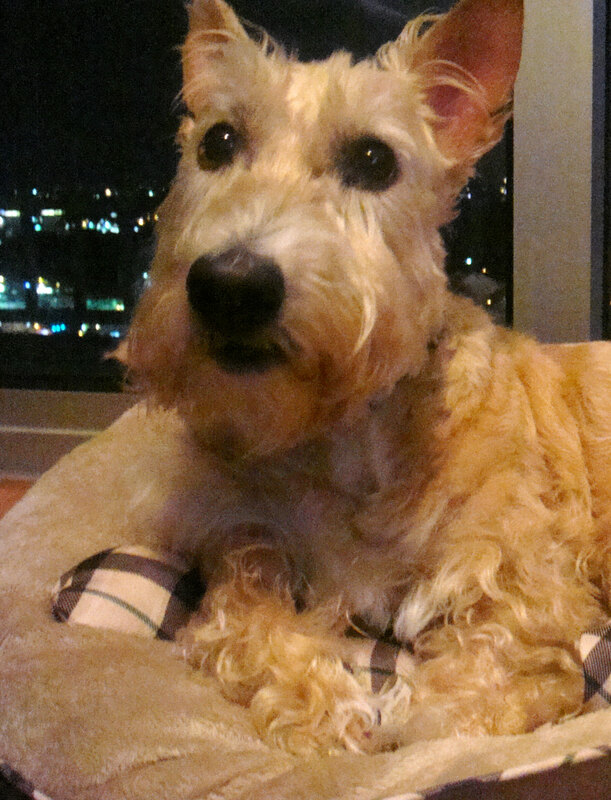 What is the story behind your liver issues?My Maggie has REALLY high liver enzymes - Alk phos near 7000. Her vet has had her on denamarin and ursodiol. They aren't improving but they are not getting any worse. She also is hypothyroid. She's been semi-lethargic over the last week (are Scottie's ever really lethargic?) and we adjusted her thyrosyn a bit yesterday. I know Scottys always run higher than other breeds on liver enzymes and I don't really know why. There are some hypotheses out there, but nothing really convincing.